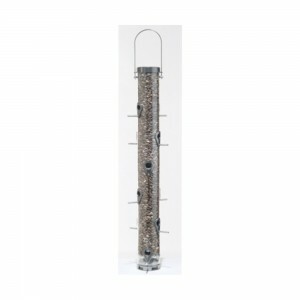 12 Port Executive Wild Bird Feeder is a classic feeder that provides some dramatic bird feeding. Simple and functional, this classic tube feeder style with high quality construction is a favorite of songbirds and will provide you with many years of enjoyment. An internal seed baffle design directs seed to the ports so that the feeder empties completely without accumulating leftovers. May be hung or pole mounted. It has an extra large seed tube with a4 quart seed capacity. Metropolitan Wholesale is New Jersey and the New York Tri-State areas one stop source for 12 Port Executive Wild Bird Feeder and all things garden related at wholesale prices. We carry a full selection of wholesale statuary, fountains, tools, cut flowers, planters and pottery, tropical plants, annuals, perennials, seeds and much more.